Welcome to the first lesson in the Lidar Raster Data R module. 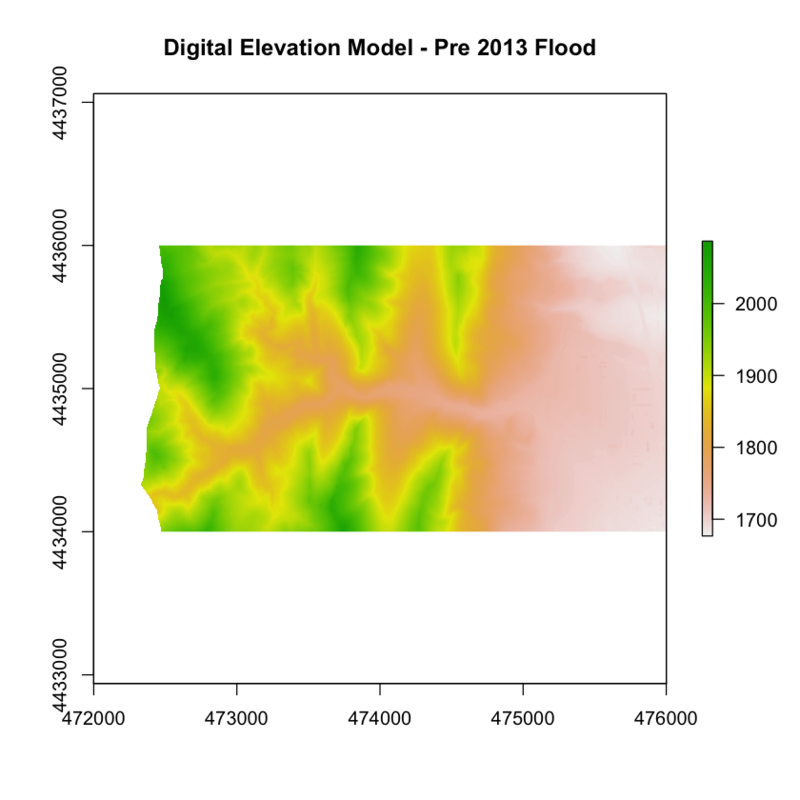 This module introduces the raster spatial data format as it relates to working with lidar data in R. You will learn how to open, crop and classify raster data in R. Also you will learn three commonly used lidar data products: the digital elevation model, digital surface model and the canopy height model. Open a lidar raster dataset in R.
List and define 3 spatial attributes of a raster dataset: extent, crs and resolution. 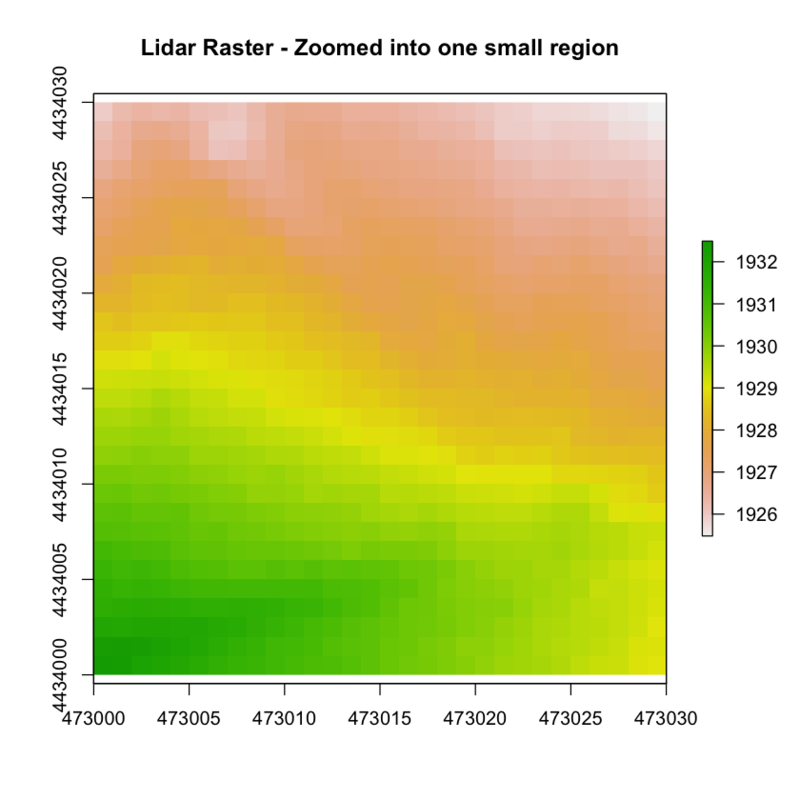 Identify the resolution of a raster in R.
Plot a lidar raster dataset in R.
To work with raster data in R, you can use the raster and rgdal packages. You use the raster("path-to-raster-here") function to open a raster dataset in R. Note that you use the plot() function to plot the data. The function argument main = "" adds a title to the plot. If you zoom in on a small section of the raster, you can see the individual pixels that make up the raster. Each pixel has one value associated with it. In this case that value represents the elevation of ground. Note that you are using the xlim= argument to zoom in to on region of the raster. You can use xlim and ylim to define the x and y axis extents for any plot. Next, let’s discuss some of the important spatial attributes associated with raster data. The coordinate reference system (CRS) of a spatial object tells R where the raster is located in geographic space. It also tells R what method should be used to “flatten” or project the raster in geographic space. What Makes Spatial Data Line Up on a Map? You will learn CRS in more detail in next weeks class. For this week, just remember that data from the same location but saved in different coordinate references systems will not line up in any GIS or other program. Thus, it’s important when working with spatial data in a program like R to identify the coordinate reference system applied to the data and retain it throughout data processing and analysis. You can view the CRS string associated with your R object using thecrs() method. You can assign this string to an R object too. The CRS string for our lidar_dem object tells us that your data are in the UTM projection. 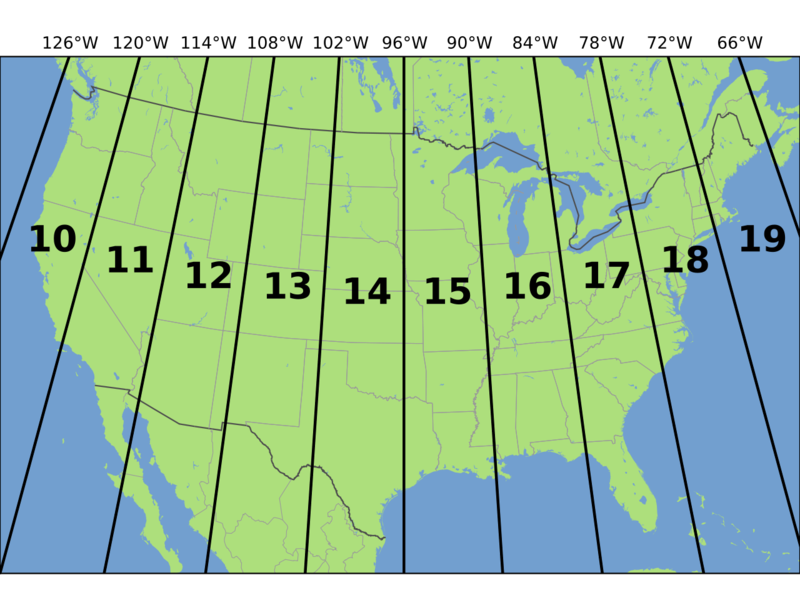 The UTM zones across the continental United States. Source: Chrismurf, wikimedia.org. The CRS format, returned by R, is in a PROJ 4 format. This means that the projection information is strung together as a series of text elements, each of which begins with a + sign. You’ll focus on the first few components of the CRS in this tutorial. +proj=utm The projection of the dataset. Your data are in Universal Transverse Mercator (UTM). +zone=18 The UTM projection divides up the world into zones, this element tells you which zone the data is in. Harvard Forest is in Zone 18. +datum=WGS84 The datum was used to define the center point of the projection. Your raster uses the WGS84 datum. +units=m This is the horizontal units that the data are in. Your units are meters. Important: You are working with lidar data which has a Z or vertical value as well. While the horizontal units often match the vertical units of a raster they don’t always! Be sure to check the metadata of your data to figure out the vertical units! Next, let’s discuss spatial extent. 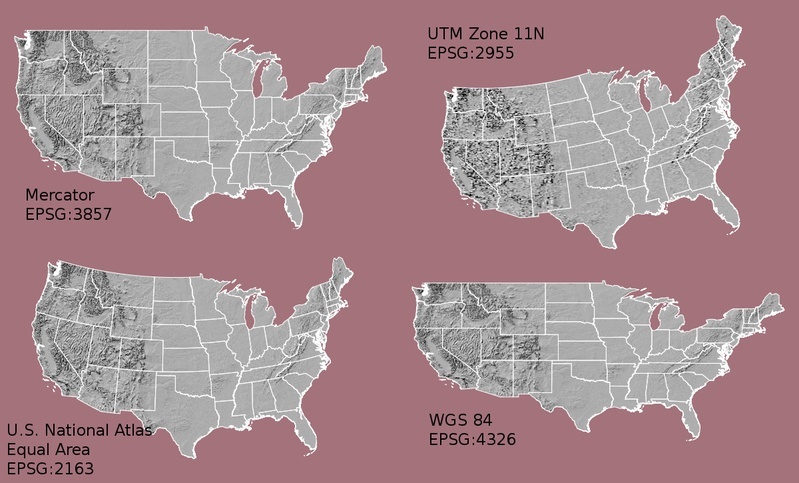 The spatial extent of a raster or spatial object is the geographic area that the raster data covers. The spatial extent of raster data. Notice that the spatial extent represents the rectangular area that the data cover. Thus, if the data are not rectangular (i.e. points OR an image that is rotated in some way) the spatial extent covers portions of the dataset where there are no data. Image Source: National Ecological Observatory Network (NEON). The spatial extent of an R spatial object represents the geographic “edge” or location that is the furthest north, south, east and west. In other words, extent represents the overall geographic coverage of the spatial object. A raster has horizontal (x and y) resolution. This resolution represents the area on the ground that each pixel covers. The units for your data are in meters. In this case, your data resolution is 1 x 1. This means that each pixel represents a 1 x 1 meter area on the ground. You can figure out the units of this resolution using the crs() function which you will use next. # what is the x and y resolution for your raster data? Resolution as a number doesn’t mean anything unless you know the units. You can figure out the horizontal (x and y) units from the coordinate reference system string. Notice this string contains an element called units=m. This means the units are in meters. You won’t get into too much detail about coordinate reference strings in this weeks class but they are important to be familiar with when working with spatial data. You will learn them in more detail during the semester! A comprehensive online library of CRS information. QGIS Documentation - CRS Overview. Choosing the Right Map Projection. NCEAS Overview of CRS in R.